The city of Kudremukh has a pleasant climate since it does not experience the kind of variances in temperature which other cities, especially those which cities in the northern regions have to endure. The weather of Kudremukh is relatively stable, with little to no extreme variations in temperatures which makes it a true delight to visit almost all times of the year. However, many tourists prefer to visit this city in the winter season which starts in November and carries through to March so that they may not only enjoy the weather but can also take part in the outdoor tourist activities they want to. Visiting the city of Kudremukh in the summer season which stretches from March to May is recommended only for those tourists who are comfortable with the combination of heat and humidity which they will be subject to, given the proximity of the city to the Western Coast. The rainy season extends from June to October which means that heavy rains will interrupt any and all tourist activities, so visiting in this season is not recommended. The winters of Kudremukh begin during the month of November, continuing till the month of March, becoming a veritable tourists’ delight thanks to the cool and pleasant weather which envelops the region. The summer season in Kudremukh extends from March till the month of May, with the city experiencing heat and humidity which many tourists might find unpleasant as well as uncomfortable. 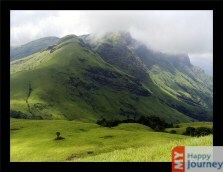 The monsoon season of Kudremukh begins June and goes on till October. The rainfall during this season greatly adds to the natural beauty of this place but tourist plans for going out might be delayed. Pleasant This month has a lot of clear skies and sunshine which combines with the inviting temperatures to make this one of the best times to visit this place and indulge in the type of tourist activities they wish to. The pleasant weather makes outdoor activities like wildlife watching and sightseeing possible. Pleasant Tourists who want to take part in activities like trekking, wildlife observation trips and sightseeing can take advantage of the perfect weather. Days are nice and sunny whereas the night times are cool with frequent breezes which keep temperatures comfortable. Those who wish to enjoy local festivities can do so with the Karavali festival which is celebrated during this month. Moderately Hot The summer season begins to increase the temperature throughout this month, increasing more so towards the last week of the month. The day time temperatures are warm thanks to sunny days with clear blue skies and night times are pleasant as well. Tourists can head out and enjoy the outdoors tourist activities they planned like adventure activities, national park visits and trekking. Hot The weather begins to heat up across April, but remains bearable for those tourists who are used to outdoors activities in the sun. Cotton clothing is recommended for visitors since it would allow free perspiration, making tourist activities like forest trips and treks a lot more appealing. Very Hot One of the hottest months but the day time temperatures are still very comfortable for those tourists who are not hesitant about going outdoors in the combination of heat and humidity which spans the city in this month. Tourists who want to take part in activities like trekking or want to spot some animals in the wild should wear some light cotton for comfort. Rainy This month will see the onset of rain as the monsoons come to town. The temperature keeps dropping as the frequency and intensity of the rainfall keeps increasing. The weather is rather pleasant on average throughout the month but those tourists who are planning on heading outdoors could face a challenge thanks to the constant downpours. Rainy The rains continue to pour on the city which means that the tourists who want to go outside would not be able to since the rain would bring all travel options to a standstill. Those who want to take part in an animal Ã¢â‚¬â€œ spotting trip could end up disappointed since animal visibility will be next to none. Rainy The monsoon continues, with the rains reaching maximum intensity in the start of this month, bringing almost all transport in and around the city to a halt. The weather itself is rather pleasant, with minimal sunlight thanks to overcast skies which keep temperatures cool all around the city but travelling is not an option. Rainy The monsoons continue during this season, significantly reducing in impact as the month progresses and winding down to intermittent showers which pepper the city. However, the start of the month is as intense as the one before it so outdoor tourist activities are still a proper challenge. The natural beauty of this region in this month however, is a great delight. Pleasant This month sees only infrequent showers in the beginning as the natural vistas surrounding the city come alive after the rains. One thing tourists should definitely check out is the many waterfalls around the city in this month. Outdoor tourist activities like trekking can be indulged in once the rain stops. Pleasant One of the best months to visit the city, this month has the kind of temperatures tourists enjoy, with the clear and sunny days and the mercury at a comfortable temperature throughout. Sightseeing, trekking, animal spotting and nature visits are some tourist activities which are very popular in this month. Pleasant This month is also very pleasant to visit, with day time temperatures staying comfortably pleasant and the night time temperatures bordering on slight cold. Carrying woolen apparel is a move all tourists coming to this city should definitely consider.